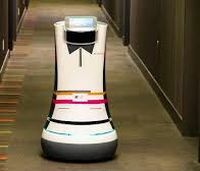 The Starwood-owned Silicone Valley area hotel is trailing the first Botlr (robotic butler) on call day and night to attend to guest requests. Once guests call the front desk for a room service request, the hotel's human staff simply load up the Botlr with an extra towel or a late night snack, input the guest's room number and the Botlr does the rest. It can navigate hotel corridors and use the elevator using a wi-fi signal. The pilot programme has officially kicked off and may be deployed at almost 100 properties if it proves a success. Starwood says the robots will augment rather than replace existing staff. The Botlr was built by California tech firm Savioke which believes there is great potential for service robots. "There are all these places, hotels, elder care facilities, hospitals that have a few hundred robots maybe but no significant numbers and we think that's just a huge opportunity," said Steve Cousins, CEO of Savioke.